Over the centuries, humankind in every culture has struggled with some timeless questions. What am I here for? What does it mean to live life well? And, perhaps most notably, what do I do with my bread that is no longer fresh? I guess it comes with the territory. If your culture makes bread, you will have to deal with the fact that after a couple of days, your fresh baked bread is no longer fresh baked. In fact, it’s a little dry and crumbly or chewy. Sometimes even stale. And let’s face it kids, stale bread is kind of a big deal. It’s almost like a cruel trick of nature, the way bread is so unbelievably, indescribably delicious when it is warm and fresh out of the oven. I don’t think it’s exactly coincidental that bread has been used as a spiritual metaphor for life and all that is life-giving. But then, after just a couple of days – after a day even – it’s glory fades into pretty much, meh. Dry uninteresting bready stuff that can only be saved by toasting (and probably lots of butter or peanut butter or cheese). So, if you look around the world, you will discover that almost everyone has found some very clever ways to use up bread that has gone stale. Necessity is the mother of invention, and using stale bread turns out to be a gold mine of creativity-promoting necessity. Panzanella; panades; stratas; pain perdu; torrijas; croutons; bread crumbs; brown Bettys; French toast. But, in my opinion, the queen of them all is the bread pudding. Well, sometimes. It’s possible that there is nothing more disappointing than a poorly executed bread pudding. A bad bread pudding is so heavy and dense you could sink a canoe with it. They are frequently over-spiced, cinnamon or chocolate being used to badly cover up the overall dry flavorlessness of it, like using an air freshener to cover up the smell of cigarette smoke. They are, most definitely, to be avoided. Which is why I pretty much never would order a bread pudding at a restaurant unless I knew I had every reason to have implicit trust in the pastry chef (or if I just planned to eat the whipped cream off of the top of it and leave the pudding itself sitting, untouched, on the plate). A good bread pudding, on the other hand, is silky, creamy and custardy, with a hint of crispness on top. Lightly fragrant with spices, and not overly sweetened, letting a little of its humble bread loaf origins shine through. A good bread pudding is enough to make you want to spend 4 hours baking a loaf of challah just so you can let it go stale. Bread pudding can be gussied up in all manner of ways – from adding fruit or chocolate to going wild with sauces – while staying true to its essential nature. 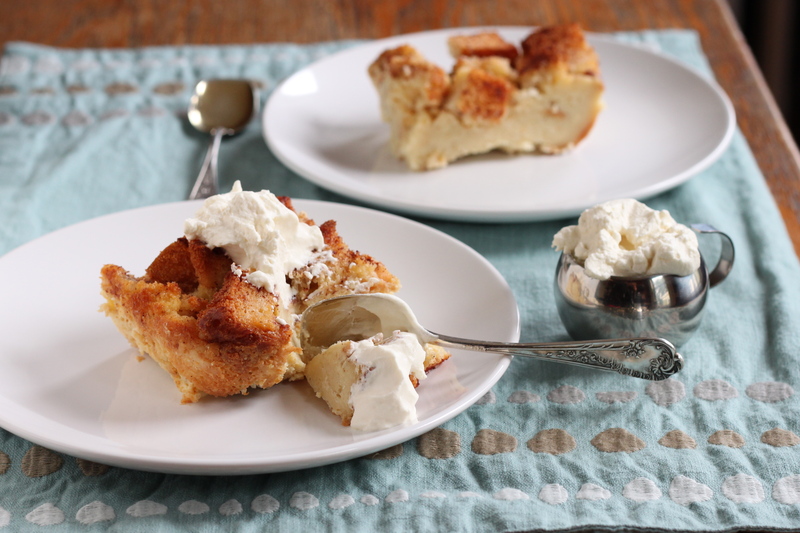 But, I find that time after time, I prefer a really simple, old fashioned bread pudding the best. 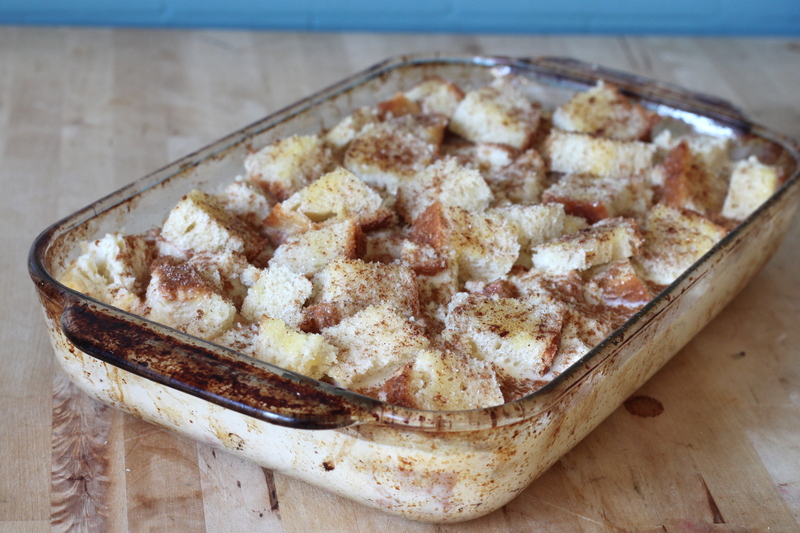 And, the bread pudding recipe that I’ve found to be the very best is the one from the folks at America’s Test Kitchen. It gets everything right. I feel absolutely no need to experiment or change it up. Eating it is like snuggling up in a warm fuzzy blanket to read your all-time favorite book. Comfortable, dependable, and delectable. 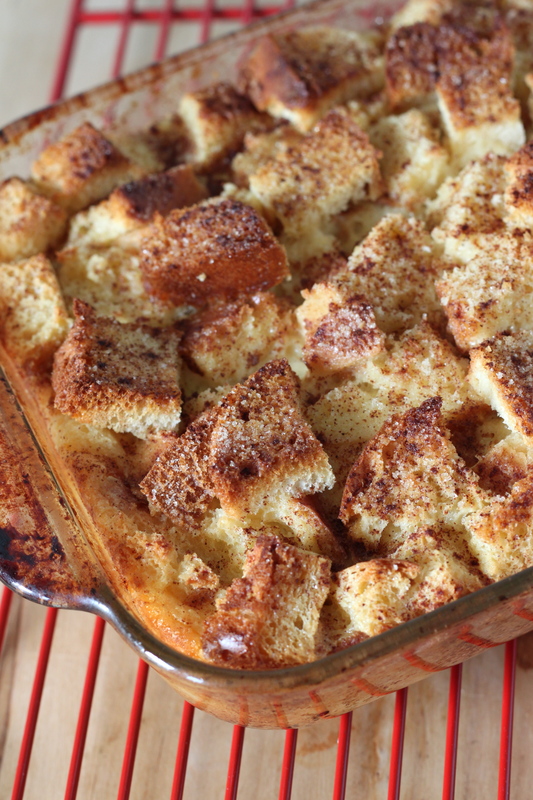 I was inspired to make bread pudding by a note from a good friend of mine saying that she had been craving bread pudding and that I really ought to post a recipe. Well, I certainly didn’t need any more coaxing than that. It also happened that my mom was just visiting and we were celebrating her birthday. So we had warm, luscious bread pudding, draped with freshly whipped cream to finish off a festive meal. Our oohs and ahs were inaudible because we were too busy munching and concentrating on the pure enjoyment of eating the pudding. And, to nobody’s chagrin, there was enough left over to repeat the enjoyment for an indulgent breakfast. 1 1/2 TBS unsalted butter, melted plus more for greasing the baking dish. Adjust the oven rack to the lower middle position. Heat to 325 degrees. Butter a 13×9 inch baking dish. Whisk eggs, yolk, sugar in a large bowl to blend well. Whisk in the milk, cream, bourbon, vanilla, nutmeg and salt. Stir in 6 cups of the bread cubes. Mix well to moisten.Let stand 20 min. Pour the mixture into the prepared baking dish. Scatter the remaining 2 cups of bread cubes on top and gently press down to partially submerge. Brush the exposed bread with the melted butter and sprinkle with the topping. Bake until the pudding turns deep golden brown, is beginning to rise up the sides of the baking dish, and jiggles very slightly at the center when shaken, 45-50 min. Remove from oven and let cool until set but still warm. I started thinking about weekend plans (not a good sign when it’s only Tues afternoon) and this is definitely on my schedule! Very excellent! I’m glad I could oblige :). that looks really good, seriously. I made this a few days ago, but I had to make a few very minor changes. I didn’t have any bourbon in the house, so I used extra vanilla extract and a little bit of rum extract. I also ran out of heavy cream before I had 2 1/4 cups, so I substituted with half-and-half. It came out delicious! I have never had bread pudding of any kind before and I think I am in love. Thanks for posting this wonderful and cozy recipe! Ooh! I bet it was delicious with the rum extract. I’m glad you liked it! Not like the one my mother used to make. She used to soak slices of bread in milk, squeeze liquid out, add spices dried fruits, 3 eggs, bake moderate oven. It was delicious served hot, and any over was fried in butter next morning for breakfast. This was the English way of doing it. Quite right this is the preferred English way! and just as delicious cold. That’s really interesting! And it sounds delicious! Thanks to both of you for sharing. I am making this right now! Wish me luck. 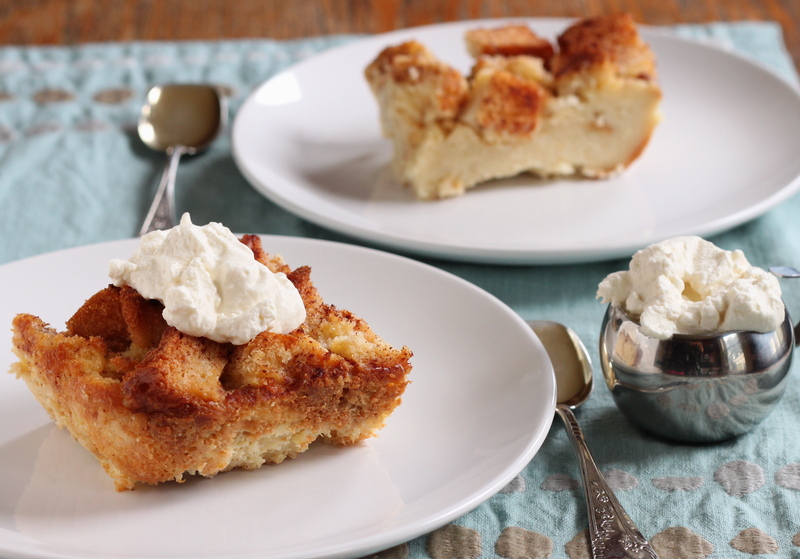 I prefer custardy bread pudding, sans raisins, and this looks like a perfect recipe for me. Thanks for sharing! You are currently reading Old Fashioned Bread Pudding at Five And Spice.